Pioneer has announced three new 3D-capable home cinema systems, with the ability to pass 3D signals over HDMI. Pioneer's new line-up includes 5.1-channel HTP-610, the bar-style 3.1 channel HTP-SB510 and the 2.1 channel HTP-FS510 front speaker system. Pioneer's latest range of receiver subwoofer home cinema systems, provide what the company claims to be a "stylish as well as entertaining home cinema experience." At the top end of the new range, the new 5.1-channel HTP-610, is described as "a brilliant solution for immersive high definition home cinema sound in the home entertainment space." For those on slightly tighter home cinema budgets, Pioneer has also launched the 3.1 channel HTP-SB510 bar-style and the 2.1 channel HTP-FS510 front speaker system. 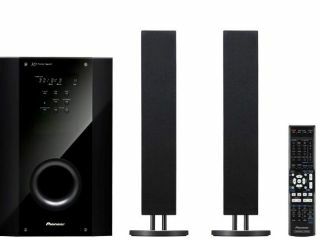 Pioneer's "HTP" product range consists of a main subwoofer unit and a fully featured home cinema receiver, combined with three speaker set variations. "All receiver subwoofer components are finished in a high-gloss, deep black, exuding a clean, minimalist feel that will enhance any living room environment," adds the press release. All three new systems include three of the latest specification HDMI (v1.4a with 3D) inputs and are all fully compatible with upcoming 3D TV broadcast receivers, Blu-ray Disc players and game consoles. They also pack in integrated decoders for the latest HD audio formats, including Dolby TrueHD and DTS-HD Master Audio, enabling "the systems to deliver sound to match the breathtaking depth and richness of high definition imagery. Finally, Pioneer promises "the ultimate iPhone or iPod experience - without the need for a docking station" as all three systems come with a specialist cable providing a complete video and digital audio connection. Pricing and exact release dates to follow. For now, head over to www.pioneer.co.uk for more.